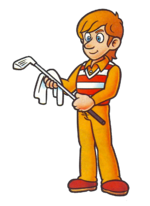 Tony is a playable human character in NES Open Tournament Golf, in which he can compete against other golfers such as Mario and Luigi. 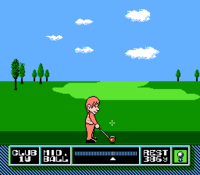 He is a semi-professional ranked golfer and is the second hardest character to beat after Billy. He wears an orange striped shirt with orange pants and black shoes, and he has orange hair. The player can also play against Tony in match play. Tony's official artwork depicts him wearing an orange, collared shirt and matching pants. On top of his shirt is a red and white striped sweater vest. His hair is given a more orange shade in his artwork than how it appears in the game, and his eyes are shown to be blue. This page was last edited on April 5, 2019, at 09:33.